Lets take a look at the argument for, and against vaccines. Pro-vaccine states that their vaccinated child is at risk because of you un-vaccinated child. They state that the vaccines work, but yet when they fail it was due to lack of a required and established percentage of vaccine uptake coverage, and thus herd immunity. This is a false and misguided claim. The pro-vaccine so called authorities, of course state that vaccines do not shed, and that the only persons at risk are the vaccinated, and thus claimed as due to the un-vaccinated that may be or become infected with a so called vaccine preventable pathogen. In fact just the opposite is true, and just the reverse of that claim, is actual reality. Vaccines can and do shed, (they have denied this), and a vaccine shed virus or bacterial pathogen, can thus change and mutate. When that happens it can do one or both of two things. Alter the pathogen enough to evade the vaccine, and as well cause other similar pathogens to become more virulent. Pertussis is a good example; Gardasil is another example and was found to be the case even prior to its June, 2006 approval, and states that concern right in the FDA VRBPAC preapproval document. 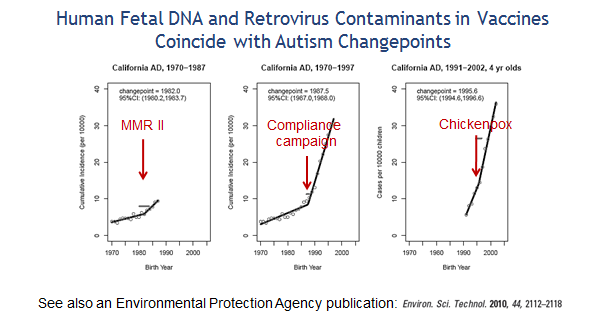 Vaccine contamination is still a problem that has not been resolved, and the FDA and CDC know as a fact that it has not been resolved. They have in fact in your own documents, admitted that they know of the potential risk that poses to human health and as well in regard to autoimmune conditions. It the vaccine unwanted contamination problem never will be resolved, as the contaminants can not be identified when you do not even know what you are looking for, and nor do they actually any concern. To do so would shed far to much light on the dangers of vaccines. How do you as well filter out and or remove an organism that is as small as or smaller than the substances you want to save as per the antigen component of the vaccine. You can filter that out? Think about it, and all the difference animal substances, blood, tissue, and organs they use in the manufacture of vaccines. Remember as well, they have already for years now as well used to make vaccines, cells from an aborted fetus. And yet with all that is known, they actually claim that there is nothing, and unwanted cells nor any contaminants, left behind from that process? That claim is as a fact, a technical and common sense, impossibility. And, VAERS is well known to represent a reporting factor of only 1 to 10% of the total adverse reactions. Do the math? 552 (“FOIA”). As grounds therefor, Plaintiff alleges as follows: (so quite obviously they felt they had something to hide, as this should qualify as public information, as it those payouts, come from the public's funding; but yet they clearly refused). Here is another vaccine, made with human diploid cells, the (chicken pox) varicella vaccine. Vaccines don't shed? That is what they tell us; right? Your sure? Take a look. And they state that it is the vaccinated that are at risk from the un-vaccinated? Really? It looks to be exactly the other way around, to me? If any doctor could and would, after hearing this below audio information, still offer the Gardasil vaccine to any person whatsoever; you are clearly conducting an irresponsible and CRIMINAL act, and offense!!! Wake up! Pay close attention as well to this little expose, on the page. And go and actually read that said VRBPAC document, for which a saved file copy was kept by Natural News. Perhaps you may be one of the people that actually think that vaccines have been proven as safe and effective? So, you then as well have obviously believed that vaccines have been purified, regardless of what animal or human and now even insect substance and/or cell tissue the vaccine is grown on, or in. Its so all good, that it must be darn near to the equivalent of vaccine savior holy water, right? And would you believe as well that there is no known explanation for the chronic illness, disorders, and autoimmune conditions, and cancer; we are seeing an increasing amount of today, in all ages, but especially children? Again, the major issue with Gardasil, the finding of the presents in the vaccine, of vaccine strain HPV-DNA, attached to the aluminum adjuvant. This is a huge issue and the FDA has done nothing but deny and down play it, it is an issue that would force a spotlight on all vaccines and they know it. It forces open a swell the whole issue of what is known as molecular mimicry, in regard to the harm of vaccines. The CDC will as well dodge these issues until hell freezes over, if they can. There are similar contamination issues and have been noted and written on, with, Rotarix, Gardasil, and as well the MMR vaccine. MMR vaccine also uses human diploid tissue, in its production. The CDC is asleep that the science board room, on all levels; intentionally. The incoming science has literally and apparently very little of it made its way to their desks since 1961, when the crank telephones were replaced with the ones with rotary dials. Apparently they thought they had enough information. That's right, I made that part up, but in a literal sense, it is all to near to frighteningly true. Do you think they know, at the FDA? Oh yes, they definitely know. What are they doing? Nothing. They are simply, they and the CDC, white washing it all and when they are forced to answer to any of this. This below study actually does anything but, reassure the non contaminant safety of vaccines; and as well yet leaves many unknowns. Biohazard potential for live viral vaccines containing naked or free nucleic acids from contaminating (adventitious) viruses. Horizontal gene transfer (HGT) refers to the direct uptake and incorporation of genetic material from unrelated species, in this instance from adventitious viral contaminants in live viral vaccines into a human host or a host-related bacteria such as those colonizing the gut. HGT is uncontrollable. Unlike chemical pollutants which break down and become diluted out, nucleic acids are infectious, they can invade cells and genomes, to multiply, mutate and recombine indefinitely. It is relevant to the issue of regulatory oversight that while the technology to detect these adventitious agents and their “cryptic” consequences was not available until relatively recently, both the dangers of generating new viruses and bacteria that can cause diseases, and spreading drug and antibiotic resistance among the pathogens, were foreseen by the pioneers of genetic engineering. That was why they called for a moratorium in the Asilomar Declaration of 1975. But commercial pressures cut the moratorium short, and guidelines were set up based on assumptions, every one of which has been invalidated by scientific findings since . The presence of dormant and relict viral sequences in the human and other animal genomes has been known for at least 20 years . These include human retroviral sequences that have been identified in live viral vaccines grown in human cells. In addition Victoria et al1 have confirmed the presence of viral particle-associated avian leucosis virus in the MMR vaccine. The combination of three RNA viruses with the enzymatic machinery to convert RNA into complementary DNA (cDNA) that is then capable of causing all the aforementioned problems with naked/free DNA, presents a particularly worrying biohazard. Not only are endogenous viruses such as HRV able to exert this effect on RNA vaccine viruses, as shown by Klennerman and Zinkernagel for lymphocytic choriomeningitis virus (LCMV) , but also viral transgenes have been found to recombine with defective viruses such as HRV, to generate infectious recombinants . In turn, recombination between exogenous and endogenous viral sequences are associated with animal cancers . In the nucleus, "microcompetition" between the foreign N-boxes and the human N-boxes in the human genes can lead to a major disease. When the foreign N-boxes belong to a virus, microcompetition between the viral DNA and the human DNA can lead to disease even when the virus is latent (dormant), or the viral DNA is broken into pieces and cannot express proteins. As predicted by Dr. Hanan Polansky, many studies found fragments of DNA that belong to these viruses in tumors, clogged arteries (arterial plaque), arthritic joints, and other diseased tissues. The FDA asserts that the foreign DNA fragments found in Gardasil pose no risk. In contrast, Dr. Hanan Polansky, from the Center for the Biology of Chronic Disease, uses his highly acclaimed discovery of Microcompetition to explain how these DNA fragments can cause major diseases. Here is of course the FDA's WHITE wash denial and in denial of all, spin on it! (Nothing is EVER enough, and nothing ever will be, as they know they have simply to much to lose if the truth be admitted to. Actually think about the magnitude of that liability. And thus it continues unabated. Currently they have no liability risk for anything as none of them can be sued due to the federal court being the current entity to cover that in a and the no fault so to speak fashion that they do through the National Vaccine Injury Compensation Program. However, if it were EVER admitted to that vaccines have done what they have, on a complete break down of this vaccine program under the spotlight it deserves; the NVIP, the compensation fund fees on vaccines, and taxpayers would never be able to bail them out of it nor that kind of implied liability. Nor would it prevent the loss of all their believed authoritative credibility, and possibly many careers. They obviously would and do realize that fact. Now, lets go to some more actual truth and reality. Gardasil is the FDA approved HPV vaccine. As of September 15, 2011, the Centers for Disease Control (CDC) received a total of 20,096 reports of adverse events in relation to Gardasil vaccination. Dr. Hanan Polansky, Director of the Center for the Biology of Chronic Disease, will discuss his discovery of Microcompetition with Norma Erickson, President of SANE Vax Inc. Dr. Polansky will use Microcompetition to explain the biological mechanism underlying the Gardasil adverse events. (The information credits for this video are as well listed on the video page itself). I work in the field of gene therapy, in which up to now, the most efficient gene delivery vehicles have been of viral origin, with retrovirus and adenovirus-based vectors being the most dominant players. In the minds of people concerned about the safety of these approaches, insertional mutagenesis into the host genome by retroviruses and acute immune reactions to adenoviruses rank on the top of the list. I have yet seen anyone in the field who realizes that the introduced foreign DNA associated with the delivery vector may have a profound impact on human health through microcompetition for host transcriptional factors. The major impact of this book on many specialties including gene therapy will be felt strongly in the coming years. Some of these scientific studies are listed on the Gene-Eden-VIR studies page. Is this vaccines actually doing more harm than good thing getting real to you yet? If not, go here to the next information. It gets worse. Garth Nicolson www.immed.org has written and published hundreds of peer reviewed medical journal articles. He discusses how vaccines are not tested for mycoplasma contamination's. Chronic Diseases: Who's killing us, and how? Now, lets ask another question as well. Do any of these vaccine contaminants, shed???? Meaning can they possibly be transferred through common human to human, transmission? And pro-vaccine states, oh no it is only the vaccinated that are at risk from the un-vaccinated? If they are at the CDC are that careless, inept, and in denial; that they would allow used a yearly-live nasal flu vaccine that is clearly known to shed; and even though the pharma clinical trials always downplay that percentage of chance; yet still plainly on the insert is the worded warning about shedding. Now, if that is not even an issue to the CDC, then what would be? And what happens every fall, when they start with the said flu mist? And they would claim it all of course to be a coincidence, and it to be only all part of the standard and known flu season, right? And it is all coincidental that the number of flu cases nearly immediately spiked. This is what they get away with. And the CDC and the American Cancer Society, etc; all still make the same old claim, that there is no proof that SV 40 contamination in the previous polio vaccine ever caused any cancer. Even though in the 70's the number of cancer cases took to an increase that was obvious to everyone that eye sight and ears. Lets take a look at what actually happened here, below! Lets see how left out of the information loop the public has been left, and and as well mislead to be? (With of course reference to obvious polio virus mutation occurring in the underdeveloped countries; using of course and of all things, the live oral polio vaccine. Increased at times virulence of the polio pathogen and with an intermix of the vaccine strain). Were those listed in this site page titled headlines, in your newspaper? Do you ask, why not? The vaccine science. The CDC tells you that there is no reason for concern, and that they have done and looked at all the needed vaccine safety science, right? They said, study after study shows no connection to anything. They say that about Gardasil as well, after doing a couple corrupt studies funded by the vaccine maker, Merck. And they get away with this! The CDC has only funded a limited amount of study; which mostly since done have as well been discredited by available unbiased analysis. They did an epidemiological study on one vaccine, the MMR; and one vaccine ingredient, Thimerosal. Where are the safety studies on vaccine aluminum adjuvants? How about multiple vaccines and doing an actual vaccinated verses entirely un-vaccinated health comparison, study? The CDC will fight that claim of the need of that study, until hell freezes over. Why? Because they damn sure already know what that outcome would be, all to obvious. They do know what those vaccines are doing, and to admit that, would take the whole system down, and as well throw the spotlight on the obvious failures of modern medicine in general. People would start to ask, to many of the right questions, and the curtain would fall with the allopathic emperor Goliath standing there, wearing nor clothes. "Pay no attention to that man behind the curtain"! Those said CDC funded studies have been as well the obvious and preferred choice of reference material at the federal vaccine court. A court that has turned away thousands of families that filed for compensation for MMR and Thimerosal connected causation of vaccine induced ASD. The current total expenditure payouts since 1989, are at over 2 billion dollars. Now since 1989, and as of Jan. 2013; over 2 trillion dollars have been paid out from this vaccine caused injury and death compensation fund. $2,550,640,666.73 is the current total figure paid out from this federal court system; which includes attorney fees, (paid out, win or lose the case). Since the first Vaccine Injury Compensation claims were made in 1989, 3,110 compensation payments have been made, $2,389,329,250.45 disbursed to petitioners and $94,604,103.72 paid to cover attorney’s fees and other legal costs. takes the situation in their own hands and gives Liposomal Encapsulated vitamin C that is known to be a effective as IV vitamin C, and the man lives. No thanks to allopathic medicine. How sick is this. Just so they can maintain in their arrogant minds the control of all. "Only a drug can cure or prevent disease"; operating policy statement made by the revolving dose with the big pharma industry FDA. All other claims cause that substance to become a drug and must be regulated the same way, and no matter how much science has been referenced and noted, behind it and the claims made. How about another avenue of fact information regarding vaccines, by Dr Russel Blaylock. The misinformation and the lies we have been fed, are just unimaginable; but are all to real. Vaccination does not equal immunisation. A profoundly correct piece of information by Mr Kalokerinos, and that has been additionally of course, been verified by other sources as well. (Vaccine, caused). Shaken Baby Syndrome or Vaccine-Induced Encephalomyelitis? If I could pick out just two issue examples that point directly to of the ignorance involved with flu vaccine, it would be this. Lancet Infect Dis. 2006 May;6(5):273-9. Would THIS make you want to get a flu shot??? Your doctor didn't tell you this? So, you develop and egg allergy you didn't have before, oh no big deal; just trust the for CDC, for profit pharma, and the to much to lose authorities, right? They told you everything, you need to know??? Guess what, we were all lied to and mislead as to the safety and effectiveness, of ALL vaccines! So obviously you can become IgE response allergic to anything in a vaccine. Latex included, and some vaccine including flu vaccines are known to contain latex contamination. MMR antibody-positive autistic sera were also positive for MBP autoantibodies, suggesting a strong association between MMR and CNS autoimmunity in autism. Stemming from this evidence, we suggest that an inappropriate antibody response to MMR, specifically the measles component thereof, might be related to pathogenesis of autism. Outbreaks of measles in vaccinated children have continued and have intensified to this day. Dr. Viera Scheibner, Principal Research Scientist (Retired) who has a doctorate in Natural Sciences from Comenius University in Bratislava, has observed that, "the ineffectiveness of vaccination," may indicate, "that the incidence of measles has increased and has not continued decreasing as it did for some 100 years before any type of measles vaccination was introduced." Anthrax Vaccine to be Tested on Kids? Stop it NOW!